Equipped with Textile Loop Eyelets with high visibility reflective tape. Foam padding in bellow tongue to enhance fit & comfort. Non-Metallic Shoe - Ideal for Transmission Industry, Pharmaceutical & Electronic Industry. 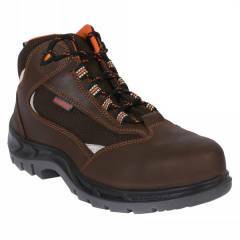 Karam FS 65 Steel Toe Brown Sports Safety Shoes, Size: 6 is a premium quality Safety Shoes from Karam. Moglix is a well-known ecommerce platform for qualitative range of Safety Shoes. All Karam FS 65 Steel Toe Brown Sports Safety Shoes, Size: 6 are manufactured by using quality assured material and advanced techniques, which make them up to the standard in this highly challenging field. The materials utilized to manufacture Karam FS 65 Steel Toe Brown Sports Safety Shoes, Size: 6, are sourced from the most reliable and official Safety Shoes vendors, chosen after performing detailed market surveys. Thus, Karam products are widely acknowledged in the market for their high quality. We are dedicatedly involved in providing an excellent quality array of Karam Safety Shoes. Strong shoes, it looks good too. Lighter as well as durable, you can have it for hard work or for stylish wear.